Safford R, Hawkins F. 2013. The Birds of Africa, Volume 8: The Malagasy Region. London: Christopher Helm. nhbs web . 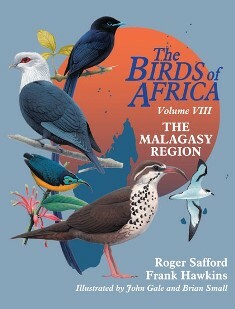 This is the 8th volume of the Birds of Africa series. It covers the birds of Madagascar, Seychelles, the Comoros, and the Mascarenes (Mauritius, Reunion and Rodrigues). It covers 352 regularly occurring species in detail (including 157 endemic birds), and briefly covers an additional 135 vagrant species. An introduction provides an overview of the physical geography, climate and vegetation of the island groups within the Malagasy region, with useful maps of the main islands. Each species account includes a map and text on Taxonomy, Distribution, Description, Identification, Voice, General habits, Food, Breeding habits, and Status and conservation. Species are illustrated in a set of plates (artists John Gale and Brian Small). The endemic weavers are Nelicourvi Weaver, Sakalava Weaver, Seychelles Fody, Rodrigues Fody, Mauritius Fody, Red-headed Fody, Aldabra Fody, Red Fody, and Forest Fody. These generally have 2-4 pages of text each. Introduced weavers are Village Weaver and Red-billed Quelea, with about 2 pages of text each.